In 1986, Tuff Brake film was introduced by Andrew Roberts Inc. to the precision metal fabricating industry as an innovative and economical way to eliminate press brake die witness marks caused by the lower die during the bending process. Tuff Brake film is specifically designed to eliminate press brake witness marks when used for bending stainless steel, aluminum, sheet metal and pre painted metals. Today, Tuff Brake is the industry standard used by thousands of satisfied customers, helping them decrease production costs while increasing productivity. 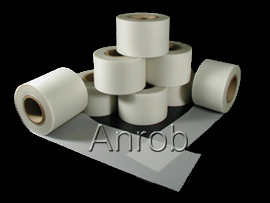 Cut off a piece of die protector film the same length as your bottom die. Fasten the edge of the film to the front of the die using masking, duct or double faced tape. Let the press brake film “flop” over the die, begin metal forming. * Actual bending amounts will vary due to type of metal being formed and angles produced.